This is part of the ongoing series at the Cathedral of the Incarnation on the St. John’s Bible and scripture as art and inspiration. In this talk, research astrophysicist Dr. Anton M. Koekemoer highlights some of the exciting astronomical discoveries about our universe, including distant galaxies, black holes, giant clouds of star formation and other discoveries revealed by the Hubble Space Telescope and other observatories. 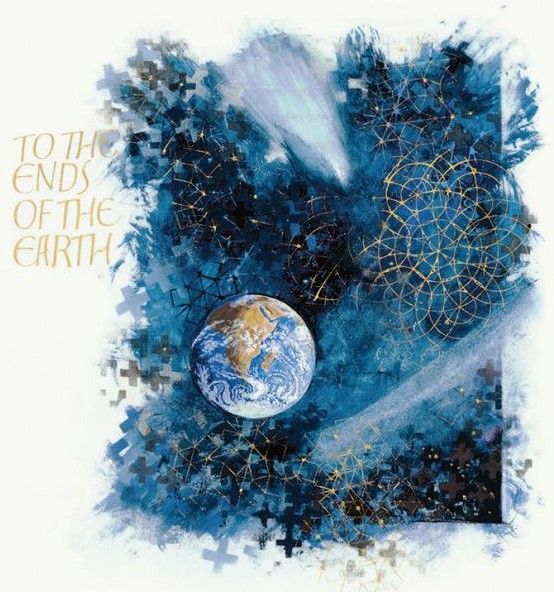 He also presents the Hubble images that were used in the beautiful illustrations in The Saint John’s Bible. He will share some personal reflections, from his own perspective as a Christian, on how our scientific understanding of this wonderful universe can be reconciled in harmony with religion to enrich our spiritual lives and our relationship with God. Dr. Koekemoer’s public lecture will take place at 7pm on May 3rd at The Mercer School with a reception for all attendees at 6pm. The lecture and reception are free with REGISTRATION. Youth Sunday April 28th @ 10am St. John's Church Following an ancient tradition (alright, not entirely ancient) the Sunday after Easter Sunday is the day we celebrate our young members. This year's Youth Sunday will feature an offering by the Junior Choir, readers from our Confirmation Class, and a sermon by high school senior, Raffi Sanna. Children from the Elements of Faith class will usher at the 10am service and bring the Eucharistic elements forward. The Children's Chapel will process with the clergy and choir. This is a great day for our church and we hope that all young families will attend. In the course of their Christian development, those baptized at an early age are expected, when they are ready and have been duly prepared, to make a mature public affirmation of their faith and commitment to the responsibilities of their Baptism and to receive the laying on of hands by the bishop. (BCP, 412) Confirmation Class at St. John’s is open to young people age 12 years old and up. Beginning on October 21, classes will be held approximately every other week, after the 10am service, until Confirmation at the cathedral in early May. Approximately 16 classes. Students will gain an understanding of the Christian faith in the Episcopal tradition through the Baptismal Covenant, the Nicene Creed, and candid conversations about the Trinity, the church and its history. Students will also be required to read at a service, serve as an acolyte and take part in a service opportunity.